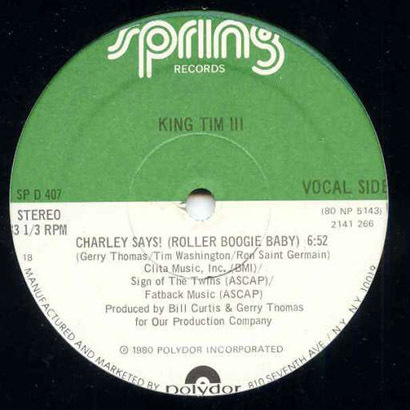 King Tim III is considered by some to be the first ever recorded rapper (This has been argued and debated over the years). He first appeared on The Fatback Band‘s “Personality Jock” back in 1979, which peaked at #26 on the R&B charts, staying on there for eleven weeks. Most people remember him the most for this iconic release, which actually dropped a month prior to Sugarhill Gang‘s “Rapper’s Delight”. For me, I prefer the vibe on “Charley Says“. I love the playful word play he exhibits in his flow, as well as the symbiotic funky bassline that dominates through out. This track was also produced by Bill Curtis, the founding father and drummer of The Fatback band. I’ve always been a big fan of old-school boogie rap, and whenever I go in that direction in one of my sets, this jam always makes it’s way into the mix! This is one of many amazing “Forgotten Treasure” tracks feature on our free compilation. Get it get it below! Copyright © 2007-2019 Music Is My Sanctuary. All Rights Reserved.